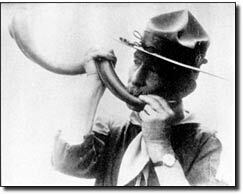 On the morning of September 19, 1919, Lord Robert Baden-Powell blew a kudu horn at Gilwell Park on the edge of Epping Forest near London. Thus began the world's first Wood Badge course. Since that day, wherever Wood Badge is held, it is on Gilwell Field. Over 100,000 people have attended Wood Badge in courses held around the world. Upon completion, a Scouter receives a certificate and two beads, and becomes a permanent member of Troop 1, Gilwell. The two wooden beads replicate the beads obtained by Baden-Powell during a campaign in Africa in 1888. These originally belonged to Dinizulu, an African chieftain. In searching for a suitable recognition for the men who completed his first course, Baden-Powell remembered the beads and decided to present a bead to each participant. From then on, the course was called "Wood Badge." The course first came to the United States in 1936. Held at the Schiff Scout Reservation in New Jersey, it still had a strong British flavor, complete with menus heavy on foods that had been boiled for several hours. The Americans were less than enthusiastic, and a war intervened. In 1948, a revised American course was offered for the first time at Schiff. It was a major success, in spite of rain on four of the nine days. The first four patrol names, which are animals found all over the U.S., were introduced--Eagle, Bobwhite (called quail around here), Fox, and Beaver, and the course featured a kudu horn. As the years went by, the course focused on scoutcraft, how to teach it to boys, and/or how to run training courses. There have been courses for each of the major program areas--Cub Scouts, Boy Scouting, Varsity, and Exploring. The 21st Century Wood Badge course, revised in 2001, brings together leaders from all areas of scouting--Cub Scouts, Boy Scouts, Varsity, Venturing, and the professional area. Reflecting the best of nearly a century of scouting experience, the course also draws upon the most current leadership models used by corporate America, academic circles, and successful outdoor leadership organizations through the country. You will live the magic of scout leadership training as envisioned by the founder of scouting, Lord Baden Powell. There are two parts to Wood Badge training: experiential learning and then application of the leadership skills in your scouting position. This combination of practicing the skills with fellow participants and applying the skills in your scouting position is incredibly effective. A key area of the process is team development and learning to recognize the stages through which developing teams must pass. Participants learn to apply appropriate leadership strategies that enable teams to reach their highest levels of performance.